Critically acclaimed fiction writer, poet and essayist Julianna Baggott is coming to Savannah for Georgia Southern University’s Armstrong Visiting Writers Series. Baggott will give a reading at Savannah Coffee Roasters on March 7 at 7 p.m. The event is free and open to the public. Baggott has published over 20 books under her name and her pen names Bridget Asher and N.E. Bode. 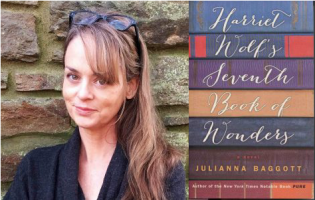 Her novels Harriet Wolf’s Seventh Book of Wonders (Little Brown, 2015) and Pure (Hachette, 2014) were New York Times Notable Books of the Year, and Which Brings Me to You, which she co-wrote with Steve Almond, was a Kirkus Reviews Best Book of 2006. Baggott’s work has appeared in The New York Times Book Review, The Washington Post, The Boston Globe, The American Poetry Review, The Atlantic and on NPR, among others. There are more than 100 foreign editions of Baggott’s novels published or forthcoming overseas. She is an associate professor at Florida State University’s College of Motion Picture Arts where she teaches screenwriting. From 2013 to 2017, she held the William H.P. Jenks Chair in Contemporary American Letters at the College of the Holy Cross. The event is presented by the College of Arts and Humanities on the Armstrong Campus. Additional support for the event is provided by the Department of Writing and Linguistics and the Department of Literature at the Armstrong Campus, as well as Gail and Mickey Rountree, in memory of their son Rhett Morgan Rountree, among other patrons of the series.